Researchers at Tohoku University have identified a previously uncharacterized type of autophagy, during which an autophagic process termed chlorophagy removes collapsed chloroplasts in plant leaves. The findings could lead to new methods for controlling the aging of plants. Chloroplasts are responsible for CO2 assimilation as photosynthesis reactions that need solar energy. As chloroplasts cannot use all the energy received from strong sunlight on a sunny day, they accumulate photodamage. The removal of damaged compounds is known as an essential process for plant survival in nature. But how collapsed chloroplasts are removed has yet to be explained. Autophagy is the "self-eating" process of consuming unwanted elements in the cells of eukaryotes such as yeast, humans and plants. Dr. Masanori Izumi, from Tohoku University's Frontier Research Institute for Interdisciplinary Sciences, suspects that the turnover of damaged chloroplasts might be accomplished by any process of autophagy. "Chloroplast turnover is also important in the production of crops." says Izumi. "As crops like rice or wheat turn from green to golden before harvest, chloroplasts are consumed, then nutrients are released and recycled to produce grains as a result of aging. We want to understand the basic, overall mechanism involved in the breakdown of chloroplasts." According to the study, when a cress plant known as Arabidopsis thaliana is exposed to light stress from Ultraviolet-B (UVB) strong visible light or natural sunlight, chloroplasts are mobilized to the vacuole - an enclosed space where digestion occurs in plant cells. 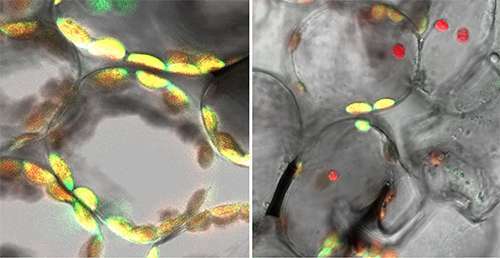 This phenomenon did not occur in the mutant plants lacking autophagy machinery, in which damaged chloroplasts showing abnormal shapes accumulated. The team also discovered that the mutant leaves die more easily after exposure to UVB compared to the naturally occurring wild leaves. "In the mutants, the production of a reactive oxygen species, hydrogen peroxide, was stimulated after UVB damage. Chlorophagy is likely to be important in suppressing the production of toxic compounds and enabling survival under light stress," explains Izumi. The researchers concluded that the chlorophagy process serves to remove collapsed chloroplasts under light stress conditions. This finding opens up new biological questions related to the regulation mechanism of chlorophagy, including how damaged chloroplasts are recognized and mobilized to the vacuole. The team believes that the identification of genes specifically regulating chlorophagy could help to create new approaches to manipulating chloroplast turnover during crop aging.